Every Memorial Day weekend, my beer buddy, Alan, has a family get together. Moms and dads, aunts and uncles, and all manner of cousins eat, drink and catch up on the past year. They also have a themed wine tasting. One year it’s Zinfandel, the next it’s Pinot Grigio. It’s the call of that year’s Wine Wrangler. This year, Alan asked if there were any good canned wines. Yep, this year’s theme is canned wines. And that is an interesting question. Are there any good canned wines? I had to take a day or two to think on that. And then I recalled: Yes! I had had a canned sparkling wine some years ago. It was pretty good. In fact, it had garnered quite a few awards over the years. 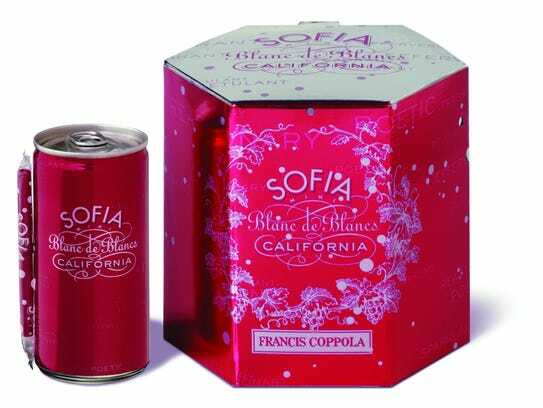 It had to have been 15 or so years ago that I first tasted Coppolas’s Sofia sparkling from a can. It came in an attractive pink hexagon box with four 187ml cans in it – and four straws. I eschewed the straw and reached for a more traditional glass flute. The effervescent Sofia Blanc de Blancs is a blend of mostly Pinot Blanc with a bit of Riesling and Muscat. With a little online research, I found that wine in a can was a real novelty 18 years ago. And it’s remarkable how much that part of the wine industry has grown. It’s not just sparkling wines anymore, now it’s still wines that are canned. A handful of wine producers are beginning to see a profitable niche for cans in the marketplace. According to the latest Nielsen data, in 2016 canned wine sales grew to $14.5 million, up from $6.4 million the previous year. That’s a healthy growth spurt that wineries are paying attention to. So, what’s good out there? Well, my first recommendation would be Joe to Go from Oregon’s star winemaker, Joe Dobbes, who recently retired from the helm of Dobbes Family Winery and Wine by Joe. He turned over the reins to a hard-working millennial, Chief Executive Officer Gretchen Boock. She was one of Dobbes’ first hires when he opened his winery in 2002. Dobbes began his career in Oregon some 30 years ago, beginning at Willamette Valley Vineyards and then launching his own eponymous brand some years later. Wine by Joe was later launched — in 750ml bottles — for a more affordable everyday type of wine. 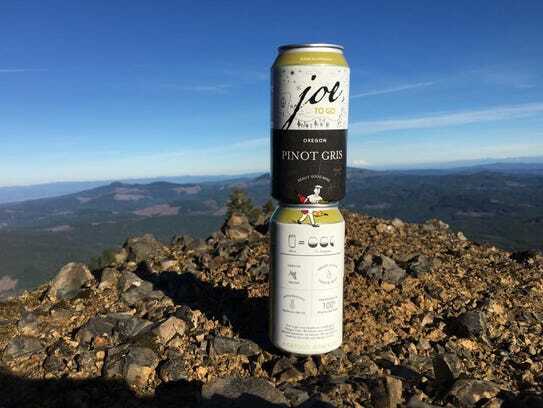 The Wine by Joe brand recently entered the canned wine market with Joe to Go Rosé and Pinot Gris. With many accolades over the years, including Wine Business Monthly’s #1 Hot Small Brand of 2011, this would be my pick for the can of wine competition. 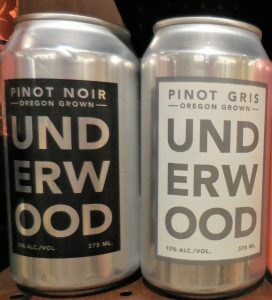 Union Wine Co., in Tualatin, Oregon, pioneered canned wine in the Northwest with its Underwood brand. It is the largest by far, producing over 4 million cans in 2017. Its mission is to produce affordable Oregon wines that are approachable and ready-to-travel anywhere. 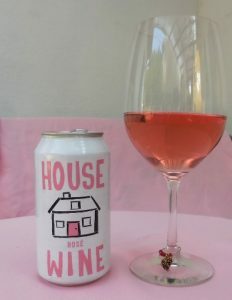 The Pinot Noir, Pinot Gris, Rosé and a white blend of Riesling and Gewurztraminer dubbed Get it Girl are sold as four-packs (equal to 2 bottles) or flats (24 cans — equivalent to one case of wine). All flats automatically receive 10 percent discount when purchased online. Seattle’s Precept Wine produces canned wine – around 4.8 million cans a year. House Wine was created with the goal of bringing good affordable wine to the picnic table. With over 30 “best buy” recommendations, and varietals such as Chardonnay and Pinot Noir plus a Rosé with grapes sourced around the world, this could be your everyday house wine contender. Seattle’s Precept Wine produces around 4.8 million cans a year of its various wines. The canned wine trend is growing. When you’re out in the garden, out on the boat, or hiking up to Lower Lena, a can may be the best way to go. Cans are better in bottle-unfriendly venues like concerts, theaters and picnics at the beach. Cans are discreet when you need to be. But I highly recommend you to forget the straw and bring a cup of some sort. It’s impossible to smell the aroma from a can. And isn’t that half of a wine’s charm?